Do you want to know what the oldest form of warfare-related protection equipment is? Helmets have been in use by soldiers and warriors for thousands of years, with evidence that they were first used 4,000 years ago by the Sumerians in the Middle East. Your head and face is one of the most important parts of your body to protect in combat. The last thing you want is to sustain damage to your skull or brain, which can take you completely out of the fight even if the rest of your body is in excellent condition. Today, helmets have evolved considerably, but the reasoning behind them has not. U.S. soldiers who served/are serving overseas in the Middle East, for example, continue to wear helmets and with good reason. A helmet truly can mean the difference between life and death. As warfare has developed, so have helmets. Now they need to accommodate technological equipment (such as tactical flashlights) while simultaneously offering superior head and face protection over helmets built previously. Now you may point out that you’re not in the military or even in law enforcement or any other dangerous role, and therefore don’t really need a tactical helmet. In an SHTF disaster scenario, for example, you will be stuck on your own with the responsibility of having to defend yourself and your family. What happens if you sustain a traumatic brain injury whilst defending your house and property? You’ll be instantly taken out of the fight and perhaps even die, which means that your family’s chances of survival are going to drop significantly as well. 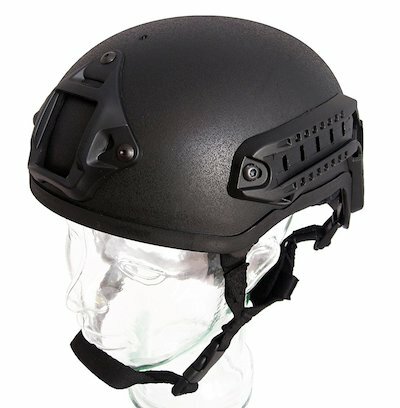 Needless to say, the tactical helmet is an essential piece of equipment for any soldier, law enforcement officer, or civilian who has the expectation that one day they might be involved in a combat situation. For civilians especially, it’s without question one of the most overlooked gear pieces that you can possibly have. 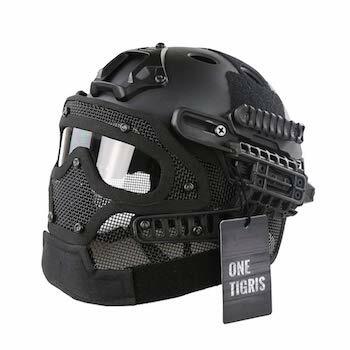 There are also an extremely wide variety of different tactical helmets for you to choose from, and from a number of different reputable manufacturers such as Team Wendy, Ops Core, and Precision. These companies focus on producing lightweight and yet durable helmets with high-impact resistant materials. The ImpaX Core Mich 2001 helmet is constructed by DLP Tactical and is designed to protect your brain and skull from trauma and physical abuse. It’s not a heavy helmet by any means and therefore doesn’t offer the best protection on the market (for instance, it can’t stop a bullet), but if you’re running and trip only to fall hard on rock solid concrete, this helmet will keep your head protected and spare you a deadly blow to the head (though admittedly you’d probably still have a headache in that scenario). The shell of the ImpaX Core is built out of a nylon fiber material, and it also comes installed with a Mil-Spec Night Vision Goggle Mount, which will make operating in low light or entirely dark conditions much easier. The Maritime Helmet from Lancer Tactical is built out of a very high grade and durable ABS plastic material. It also has an adjustable suspension system so it can accommodate most head sizes in a comfortable manner, and the internal padding on the insight makes the helmet even more comfortable while also adding an extra degree of protection. The night vision mount on this helmet makes it easy to add a GoPro camera, and there is also Velcro installed so you can add patches to truly customize it the way you want. A rail system on the side of the helmet makes it easy to attach tactical flashlights. 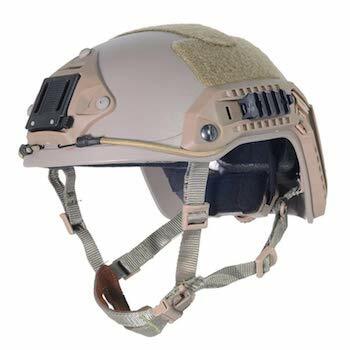 The OneTigris PJ Type Tactical Fast Helmet is unique because it’s a full face helmet, meaning it protects your entire face and not just your head and skull. This is good because it helps to keep dust and debris out of your eyes and mouth, and your eyes in particular are highly vulnerable parts of your body that you will want to keep fully protected. The inside of the helmet consists of anti-fog goggles and a padded interior to make it more comfortable. There’s also a rear adjustment dial where you can loosen or tighten the helmet as you see fit. The Velcro panels that line the top and the sides of the helmet make it easy to attach nameplates and patches. If you don’t desire having the full face covering, the face shield component of the helmet can be easily detached as well with simple press of a button. And thanks to the side rails, adding additional accessories such as cameras, goggles, or tactical lights is incredibly easy. Don’t forget to include a high quality tactical helmet like one of the above models among your gear. In an SHTF scenario where you need to defend your house, having a helmet will do much to protect your head, face, skull, and neck from traumatic injuries that would immediately put you out of the fight.